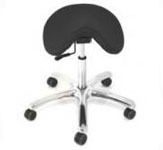 F1465 BetterPosture Saddle Chair by Jobri - Jobri Back Care Ergonomic Products - BetterBack, BetterNeck, BetterRest, BetterPosture, Nubax Tri and Theracane. Designed for proper posture for long seating durations. The Saddle Chair is designed to keep the pelvis in a more neutral position thereby aligning the back, shoulders, neck and head. The hips and thighs are kept in a more natural forward posture. The Saddle chair includes a tilt feature to allow the user to adjust the angle of the seat for an even better customized fit. Chair Base is made of a polished aluminum frame. Seats are made of a supportive polyurethane foam with black vinyl covering and nylon wheel casters. Gas pnuematic height adjustment. Height range:21" to 28". Seat Size:14" x 17".